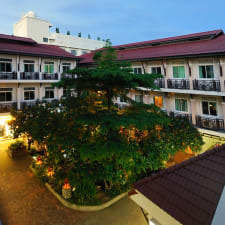 Hotel Rambuttri Village Inn & Plaza offers resort-style accommodations in Bangkok. A selection of bright and modern guest rooms provide visitors with amenities including cable TVs. Some upgraded units add on bonuses such as sitting areas, DVD players, courtyard views and minfridges. Visitors can take a dip in the two rooftop pools or soak up some rays on the sun decks. Massage services are also available. Other amenities include 24-hour reception, a safety deposit box, fish pool and garden, pharmacy and Internet cafe. Additionally, guests can enjoy starting the day off on the right foot with a complimentary breakfast buffet served in the hotel's restaurant. Hotel Rambuttri Village Inn & Plaza is conveniently located within walking distance to Khaosan Road and all its shopping, dining and nightlife opportunities. It is also close to attractions including the Grand Palace and Wat Pho Temple. Situated in a central location. If you enjoy being close to all the action, you will be happy to know that guests said that they appreciated the hotel is situated on Khao San Road, near plenty of area attractions, things to do, and places to dine. If the first meal of the day is also high on your list of importance, you will also appreciate that visitors had good things to say about the buffet breakfast offered. People said the options were plentiful and food was generally good. There were also favourable comments about the hotel's swimming area, which guests found to be an added bonus. Could use some renovating and better upkeep. The property may be in need of some TLC and better maintenance. There were negative remarks about the hotel being a little old and outdated and in need of better cleaning, especially in the bathrooms. Customer service may be hit or miss. While not everyone was in agreement, there were some negative remarks about staff members not always be the most friendly or hospitable. A couple of additional complaints. Some people were not happy with the extra charges for baggage storage or the deposit fees for rooms. There were also negative comments about the facilities being a bit noisy at times. People complained about air conditioners being loud or noise from the street or guests in other rooms being bothersome. You may want to bring along some ear plugs if noise bothers you.